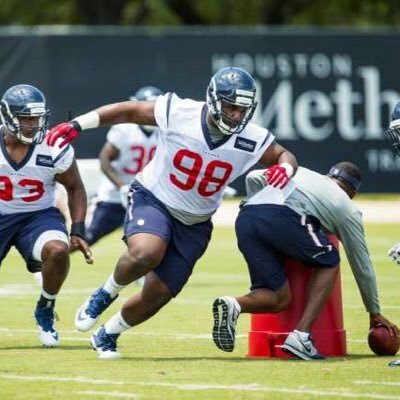 Texans defensive nose tackle David Vernon ‘D.J.’ Reader was a rookie last season for Houston. He has 22 COMB, 15 AST, 1.0 Sack, 0 INT and 0 YDS to date. As he gets set for year two, everyone is excited to see him play and add depth to the defense. Reader will have big shoes to fill, as he takes the place of Vince Wilfork, who recently retired. Reader has performed exceptionally well in his assortment of alignments. This includes a traditional one-technique nose, all the way to a wide five-technique. He has demonstrated that he is versatile and provides significant depth at Houston. Reader is 6-foot-3, 335 pounds and looks strong when he plays. He will surely do all he can to keep Houston in the top 12 against the run. Houston may be sad to see Wilfork go, but with Reader ready to take the reigns, they could have a smooth transition.